Two techniques for isolating cellular lipid droplets from 1) yeast cells and 2) human placentas are presented. The centerpiece of both procedures is density gradient centrifugation, where the resulting floating layer containing the droplets can be readily visualized by eye, extracted, and quantified by Western Blot analysis for purity. Mannik, J., Meyers, A., Dalhaimer, P. Isolation of Cellular Lipid Droplets: Two Purification Techniques Starting from Yeast Cells and Human Placentas. J. Vis. Exp. (86), e50981, doi:10.3791/50981 (2014). Lipid droplets are dynamic organelles that can be found in most eukaryotic and certain prokaryotic cells. Structurally, the droplets consist of a core of neutral lipids surrounded by a phospholipid monolayer. One of the most useful techniques in determining the cellular roles of droplets has been proteomic identification of bound proteins, which can be isolated along with the droplets. Here, two methods are described to isolate lipid droplets and their bound proteins from two wide-ranging eukaryotes: fission yeast and human placental villous cells. Although both techniques have differences, the main method - density gradient centrifugation - is shared by both preparations. This shows the wide applicability of the presented droplet isolation techniques. In the first protocol, yeast cells are converted into spheroplasts by enzymatic digestion of their cell walls. The resulting spheroplasts are then gently lysed in a loose-fitting homogenizer. Ficoll is added to the lysate to provide a density gradient, and the mixture is centrifuged three times. After the first spin, the lipid droplets are localized to the white-colored floating layer of the centrifuge tubes along with the endoplasmic reticulum (ER), the plasma membrane, and vacuoles. Two subsequent spins are used to remove these other three organelles. The result is a layer that has only droplets and bound proteins. In the second protocol, placental villous cells are isolated from human term placentas by enzymatic digestion with trypsin and DNase I. The cells are homogenized in a loose-fitting homogenizer. Low-speed and medium-speed centrifugation steps are used to remove unbroken cells, cellular debris, nuclei, and mitochondria. Sucrose is added to the homogenate to provide a density gradient and the mixture is centrifuged to separate the lipid droplets from the other cellular fractions. The purity of the lipid droplets in both protocols is confirmed by Western Blot analysis. The droplet fractions from both preps are suitable for subsequent proteomic and lipidomic analysis. Cellular lipid droplets are dynamic organelles that serve multiple functions in cells. They are storage hubs for neutral lipids, which can be converted into energy or used for phospholipid synthesis. The droplets play central roles in physiological and pathological conditions including atherosclerosis, obesity and related metabolic diseases, and also infectious diseases1,2. In addition, they are intriguing sources for biodiesel fuels. Much information on the cellular roles of lipid droplets has been obtained from proteomic and lipidomic analysis of droplets purified from wide-ranging organisms3. These organisms have included bacteria4,5, yeast6-11, plants12,13, nematodes14, and flies15,16. Given the interest in the role of lipid droplets in human metabolic diseases, droplets have also been isolated from cultured animal cells and animal tissues. Cultured cell lines have included 3T3-L1 adipocytes17, Chinese hamster ovary (CHO) K2 cells18, human hepatocyes19,20, and epithelial cell lines21. Animal tissues from which droplets have been isolated have included mouse skeletal muscle22, liver23, and mammary glands23. As mentioned above, the goal of most droplet isolation studies is to perform proteomic analysis on the bound factors and lipidomic analysis on the neutral and phospholipids. Since neutral lipids - the most numerous component of lipid droplets - are less dense than most other cellular materials, isolation of droplets has traditionally been performed using density gradient centrifugation. That technique is the centerpiece of both preps presented here. Previous techniques6,24 are combined and modified into a visual presentation of the isolation of droplets from cultured fission yeast cells and noncultured human cells obtained from placental tissue. The goal is to show the broad applicability of this technique by choosing two vastly different cell types as starting points for the droplet isolation. This technique should be useful for those wishing to isolate droplets from most organisms. Protocol 1 describes the isolation of lipid droplets from the fission yeast, Schizosaccharomyces pombe, which has been used as a model for observing droplet formation during eukaryotic cell division25. The budding yeast Saccharomyces cerevisiae has been used extensively as a model organism for studying lipid droplet biology. Protocol 1 is applicable to both organisms and differences in the preparations are highlighted. Protocol 2 describes the isolation of lipid droplets from placental villous cells, which are in turn obtained from human term placentas. The collection of term placentas provides a unique opportunity to safely and ethically obtain 200-250 g of readily available human tissue26, which contains significant numbers of lipid droplets. This is in contrast to most lipid droplet isolation work in higher eukaryotes where the droplets originate from cultured cells. In those studies, fatty acids are often added to the culture to promote the synthesis of neutral lipids and thus the growth of droplets. This is in contrast to the work here where lipid droplets are formed under native conditions in placental tissue. The purities of the lipid droplet fractions are determined by Western Blot analysis using organelle marker antibodies. These two protocols will yield lipid droplet fractions that are suitable for subsequent proteomic and lipidomic analysis. Isolation of droplets from the popular model organism budding yeast Saccharomyces cerevisiae is almost identical to the following protocol6. Differences in the preparations are noted. Prepare the media. Combine 36 g of YE5S powder per liter of dH2O in glass bottles or culture flasks. About 2 L of media will be needed. Autoclave the media at 121 °C for 20 min. Allow the media to cool to room temperature. For S. cerevisiae replace YE5S with YPD. Place 10-20 ml of the cooled YE5S media into a 250 ml culture flask using sterile techniques. Inoculate the media with a small amount of yeast cells from an agar plate using a sterile wooden stick or equivalent. Let the cells grow to the desired optical density at 30 °C. Measure the optical density at a wavelength of 595 nm using a spectrophotometer. Place the remaining media in the 2.8 L flasks. Use no more than 1 L of media per 2.8 L flask to ensure proper mixing during cell growth in the shaking incubator. The final yield of wet cells should be about 10 g to be able to acquire enough lipid droplets for proteomic and lipidomic analysis. Introduce the cells from step 1.2 into the 2.8 L flasks each having 1 L of media that were prepared in step 1.1. Grow the cells to the desired density at 30 °C. Make sure that the cells have lipid droplets. Reserve 1 ml of the cells. Measure the optical density (O.D.) of the sample. Add 0.1 ml of a 100 mM stock of BODIPY 493/503 in ethanol per O.D. of cells to the sample. Place 3 μl of the sample between a glass slide and a glass cover slip. 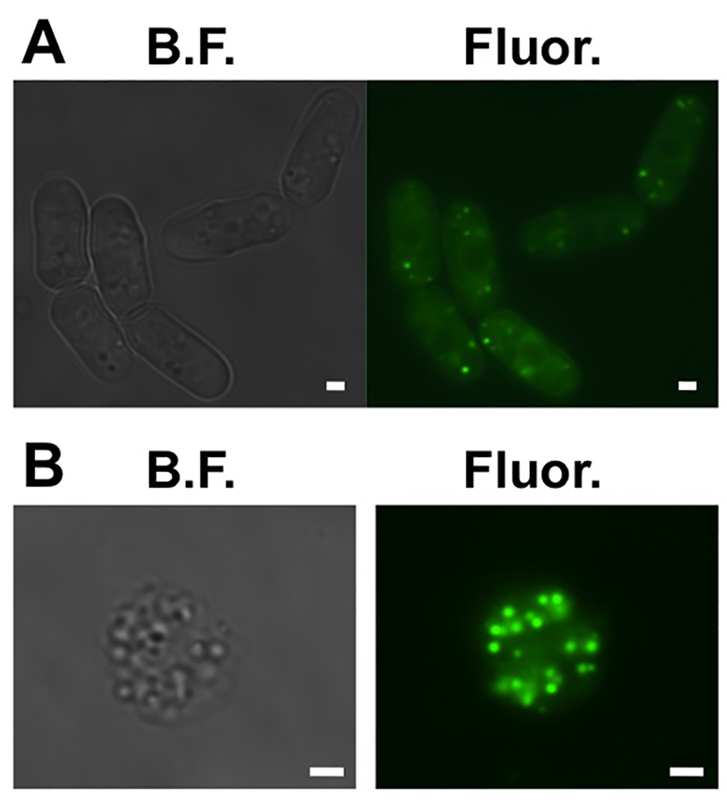 Visualize under a fluorescent microscope with a GFP filter (Figure 1A). Pellet the cells from step 1.5 at 4 °C at 3,800 x g for 10 min. Work in batches depending on the capacity of the centrifuge tubes. Pour off the YE5S media and wash the cells with a buffer of EMM + 600 mM sorbitol. Sorbitol provides osmotic support. Transfer the cells to a sterile 50 ml centrifuge tube and pellet the cells at 4 °C at 2,000 x g for 10 min. Remove the supernatant. Weigh the wet cells. Resuspend the cells in 2 ml of (EMM + 600 mM sorbitol) buffer per gram of cells. Add 5 mg each of 1) yeast lytic enzyme and 2) yeast lysing enzymes from Trichoderma harzianum per gram of wet cells that were weighed in step 1.9. For S. cerevisiae augment these enzymes with the same amount of Zymolyase. Incubate the cells at 30 °C under gentle shaking at 100 rpm for 60 min. Check to make sure that the spheroplasts have lipid droplets. By repeating step 1.6 (Figure 1B). Pellet the spheroplasts by centrifugation at 4 °C at 2,000 x g for 5 min. Carefully remove the supernatant using a plastic transfer pipette. Gently resuspend the pelleted spheroplasts with ice cold 10 mM Tris-HCl, 600 mM sorbitol, and 200 μM EDTA. Keep in mind that the spheroplasts are very fragile. Pellet the spheroplasts again using the same settings as in step 3.1. Carefully remove the supernatant and resuspend the spheroplasts using a plastic transfer pipette in 12% Ficoll, 10 mM Tris-HCl, and 200 μM EDTA at a concentration of 2 ml/g-cells. Transfer the resuspended spheroplasts to a glass homogenizer and gently homogenize on ice, 20-30 strokes, with the loose fitting pestle of the glass homogenizer. Transfer the lysed spheroplasts to centrifuge tubes and overlay with same volume of 12% Ficoll, 10 mM Tris-HCl, and 200 μM EDTA buffer. Choose the number of centrifuge tubes to use so that each tube is about two-thirds full. Centrifuge at 4 °C at 100,000 x g for 1.5 hr in an SW28 rotor or equivalent. Allow rotor to coast to a stop (rotor deceleration = 0). Gently transfer the top floating white layer (Figure 2A), which contains the droplets, to a new centrifuge tube(s) using either a pipettor or a bent Pasteur pipette. Add enough volume of 12% Ficoll, 10 mM Tris-HCl, and 200 μM EDTA buffer to the sample so that it fills roughly one-third of the centrifuge tube. Add the equivalent volume of 8% Ficoll, 10 mM Tris-HCl, and 200 μM EDTA buffer to the top of the sample(s) in the new centrifuge tube(s). After addition of this buffer the tubes should be about two-thirds full. Centrifuge at 4 °C at 100,000 x g for 1 hr in an SW28 rotor or equivalent. Allow rotor to coast to a stop (rotor deceleration = 0). Gently transfer the top floating white layer (Figure 2B), which will contain the droplets, to a new centrifuge tube(s) using either a pipettor or a bent Pasteur pipette. Add 600 mM sorbitol, 8% Ficoll, 10 mM Tris-HCl, and 200 μM EDTA buffer to the sample so that it fills about one-third of the centrifuge tube. Add the equivalent volume of 250 mM sorbitol, 10 mM Tris-HCl, and 200 μM EDTA buffer to the top of the sample(s) in the new centrifuge tube(s). After addition of this buffer the tubes should be about two-thirds full. Transfer top white layer (Figure 2C), which should contain only the lipid droplets and bound proteins, to dialysis tubing, and dialyze O/N into 10 mM Tris-HCl and 200 μM EDTA buffer to eliminate the Ficoll. Placentas were collected from healthy women with singleton pregnancies undergoing elective cesarean section delivery prior to the onset of spontaneous labor at term. Subjects gave written, informed consent for the collection of their placenta. The collection, and subsequent use, of placentas was performed with approval from the University of Tennessee and University of Tennessee Graduate School of Medicine in Knoxville Institutional Review Board (#8757B and #3338, respectively). NaCl (1 L): dissolve 9 g NaCl (M 58.4 g/mol) in dH2O to yield a 1 L solution. Filter sterilize (0.2 μm membrane). 10x Hank’s balanced salt solution (10x HBSS) (1 L): 4 g KCl (M 74.5 g/mol); 0.6 g KH2PO4 (M 136.086 g/mol); 80 g NaCl (M 58.44 g/mol); Na2HPO4 (M 141.96 g/mol); 10 g D-glucose (M 180.16 g/mol). Dissolve each of the constituents in dH2O to yield a 1 L solution. Filter sterilize (0.2 μm membrane). Enzyme digestion buffer (0.6 ml): combine 70 ml 10x HBSS with 3.3 ml 7.5% Na Biscarbonate, 17.5 ml 1 M HEPES, and 266.1 ml dH2O; filter sterilize (0.2 μm membrane). Store at 4 °C. DNase I: just before use, add 5 ml sterile 0.9% NaCl to a vial of DNase. Keep on ice until use or store at -20 °C. Obtain a human placenta and process as close to the time of delivery as possible. Use a sealed vessel such as a cooler to transport the placenta. Always use caution when handling human biological materials. In the biological safety hood, transfer the placenta to a sterile autoclavable container, and carefully wash blood from placenta and membranes using sterile 0.9% NaCl (saline) solution. Discard bloody saline in the 1 L beaker as liquid biological waste. Place the placenta on a sterile field, with the smooth surface bearing the umbilical cord facing up. With sharp, fine-point scissors and forceps remove fetal membranes and umbilical cord. Flip the placenta over so that the maternal surface (rough surface) is facing up. Remove the overlying basal plate tissue, about 3 mm from the surface. Dissect one cotyledon at a time avoiding the chorionic plate. Collect villous tissue into a 250 ml beaker with saline. Rinse tissue several times in a separate beaker with 0.9% NaCl by swirling with forceps, using the 1 L beaker for liquid waste. Transfer one cotyledon at a time to a 150 mm Petri dish. Hold with forceps and scrape tissue with razor blade from vessels on Petri dish. Place scraped tissue into separate beaker containing 0.9% NaCl. Repeat for all tissue pieces. Transfer small portion of the tissue to the cell dissociation sieve and rinse with 0.9% NaCl extensively until the eluate becomes clear. Repeat for all the tissue. After rinsing the scraped tissue in the cell dissociation sieve, drain it of excess liquid and weight. At this point the tissue may be stored O/N in a sterile Erlenmeyer flask at 4 °C in DMEM. Prepare the tissue digestion mixture: 100 ml of prewarmed enzyme dilution buffer, 1 ml DNase I and 20 ml 2.5% 10x trypsin. Divide the tissue, transferring 60 g from total collected tissue (usually about 250-300 g) to a 500 ml sterile Erlenmeyer flask. Add the tissue digestion mixture to the Erlenmeyer flask containing the tissue, and incubate at 37 °C in a shaker for 45 min at 150 rpm. After the first 45 min dissociation, set the digestion flask at a tilt until tissue settles. Collect the supernatant, taking care not to collect undissociated tissue. Add an equal amount of HBSS to the collected supernatant and transfer into sterile 15 ml centrifuge tubes. For additional portions of undissociated tissue, repeat procedure starting from step 3.2 with the undissociated tissue. Centrifuge the homogenate at 4 °C at 1,000 x g for 15 min. For each batch, following centrifugation, aspirate the supernatant without disturbing the pellet. The placental villous cells are predominantly in the white portion of the pellet, overlying the red blood cells. Transfer the villous cells (white portion of the pellet) to a sterile 50 ml conical centrifuge tube and keep on ice. After collecting the cells from all three digestion stages, filter the suspension using a 100 μm Nylon cell strainer inserted in the top of a sterile 50 ml conical centrifuge tube. If the filtration of the cell suspension slows, lift upward on the filter to draw a vacuum within the tube. Centrifuge at 4 °C at 1,000 x g for 10 min. Carefully remove supernatant without disturbing the pellet. Before starting with the isolation process, prepare 50 ml of Hypotonic Lysis Medium (HLM) containing 20 mM Tris-HCl, pH 7.4 and 1 mM EDTA. Add protease inhibitors to HLM just before use and keep the medium on ice. In the biological safety hood, add 4 times the cell pellet volume of ice-cold HLM to the cells. Gently and thoroughly resuspend the cells by pipetting the cells up-and-down using a 10 ml pipette. Incubate the suspended cells on ice for 10 min. Transfer the cells to the Dounce homogenizer, which should be on ice. Slowly homogenize the cells by applying 20-25 gentle strokes with the loose-fitting pestle of the homogenizer. Centrifuge the cell lysate at 4 °C at 3,000 x g for 10 min to remove unbroken cells, cellular debris and nuclei. Collect the supernatant and transfer to a SW28 tube (or alternative that can be centrifuged at 25,000 x g). Centrifuge at 4 °C at 25,000 x g for 20 min to remove the mitochondria. Prepare 50 ml of 100 mM sodium carbonate (M 106 g/mol) buffer (pH 11.5) and 50 ml of 60% sucrose (w/w) solution. Add protease inhibitors to the sodium carbonate buffer just before use and keep on ice. Collect the supernatant from step 2.6 into a 50 ml centrifuge tube, adjust to 20% of sucrose and transfer into the bottom of an ultracentrifuge tube for an SW28 rotor, or equivalent. Overlay density adjusted supernatant with ~10 ml of ice-cold 100 mM sodium carbonate buffer (pH 11.5) and 0.5-1 ml of ice-cold HLM to fill the tube. Centrifuge at 4 °C at 130,000 x g for 45 min using SW28 swinging bucket rotor. Allow rotor to coast to a stop (rotor deceleration = 0). Collect the floating layer, adjust to 10% sucrose and transfer into the bottom of a 13.2 ml ultracentrifuge tube for an SW41Ti rotor, or equivalent. Overlay density adjusted supernatant with about 5 ml of ice-cold 100 mM sodium carbonate buffer (pH 11.5) and 0.5 ml of ice-cold HLM. Centrifuge at 4 °C at 274,000 x g for 60 min using SW41Ti swinging bucket rotor. Allow rotor to coast to a stop (rotor deceleration = 0) to minimize disruption of the lipid droplet layer. Carefully collect the top floating layer (Figure 2D) containing lipid droplets with a 1 ml pipette and repeat step 3.4. Centrifuge at 4 °C at 274,000 x g for 30 min using SW41Ti swinging bucket rotor. Allow rotor to coast to a stop (rotor deceleration = 0). Carefully collect the top white-colored floating layer containing lipid droplets with a bent Pasteur pipette into three 1.5 ml tubes containing 100 μl HLM. The recovery and purity of the lipid droplet fraction can be verified by Western Blot combined with light or electron microscopy. In addition, aliquots after different centrifugation steps can be collected and retained for determining purification efficiency. In Western Blotting, it is more appropriate to compare a volume of the lipid droplet fraction that represents an equivalent of the whole cell lysate than comparing lipid droplets to other membrane fractions on the basis of total protein content24. If the density gradient centrifugation worked as expected, the floating layer should contain lipid droplets and be depleted of other organelles throughout the progression of the high-speed spins. For Protocol 1, Western Blots were performed with marker antibodies to lipid droplets (Erg6p), and organelles that have been found to interact with lipid droplets in yeast, ER (Dpm1p), mitochondria (Por1p), plasma membrane (Pma1p), and vacuoles (Vma1p). Equal volumes of the floating layer of each three spins (steps 3.7, 3.10, and 3.13) were collected, precipitated with trichloroacetic acid (15% final concentration), and solubilized in water. 13 ml of the cell lysate (Figure 3A, "Lys") and protein prep of each three spins (Figure 3A, "Spin1", "Spin2", and "Spin3") were separated on 12% SDS-PAGE, transferred to nitrocellulose membrane, and immunoblotted with organelle specific antibodies. As expected, the lipid droplet marker protein Erg6p is present in the floating layer after each of the three spins (Figure 3A); Por1p is not present in the floating layer after Spin1 (Figure 3A); Vma1p is depleted from the floating layer after Spin2 (Figure 3A); and Dpm1p and Pma1p are not present in the floating layer after Spin3 (Figure 3A). For Protocol 2, the presence of lipid droplets isolated from human term placental villous cells was verified by staining with a neutral lipid specific fluorescence dye, BODIPY 493/503. The droplets were then visualized under a fluorescence microscope (Figure 3B). 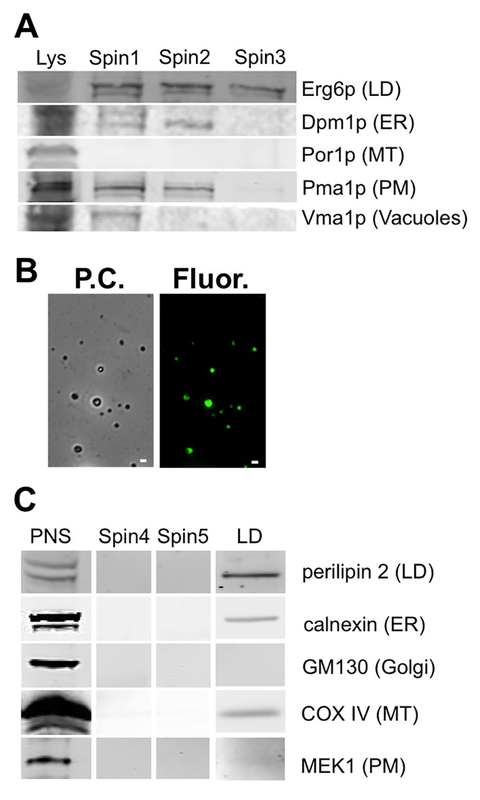 The purity of the isolated lipid droplet fractions was evaluated by Western Blotting with marker proteins for lipid droplets (perilipin 2), ER (calnexin), Golgi (GM130), mitochondria (COX IV) and plasma membrane (MEK1) (Figure 3C). The lipid droplets were de-lipidated with cold acetone and the proteins were extracted. Equal percentages of post-nuclear supernatant (PNS), the fraction beneath the floating layer of the last spin (step 3.6, "Spin4" on Figure 3C), the subsequent wash step (step 3.8, "Spin5" on Figure 3C), and de-lipidated protein prep of floating lipid droplet layer (step 3.8, "LD" on Figure 3C) were separated on 12% SDS-PAGE, transferred and immunoblotted with indicated antibodies. Perilipin 2 (also known as ADRP), the lipid droplet protein, was detected in post-nuclear supernatant and in the isolated white floating layer containing lipid droplets. Proteins specific for plasma membrane (MEK1) and Golgi (GM130) were not detected in lipid droplet fractions in either layer beneath the floating layer for Spin4 and Spin5. As previously reported, the ER protein calnexin18,27,28 and a weak staining of mitochondrial membrane protein COX IV have been detected elsewhere in the lipid droplet fraction22. These results are consistent with earlier reports showing that lipid droplets interact with mitochondria in mammalian cells29 and with the ER30,31. Figure 1. Cellular lipid droplets in fission yeast cells. (A) Bright field (B.F.) and wide field fluorescence (Fluor.) images of six representative fission yeast cells where the lipid droplets are dyed with BODIPY 493/503. (B) Bright field (B.F.) and wide field fluorescence (Fluor.) images of a representative spheroplast where the lipid droplets are dyed with BODIPY 493/503. Scale bars are 1 mm. Please click here to view a larger version of this figure. Figure 2. Floating layer after density gradient centrifugation. 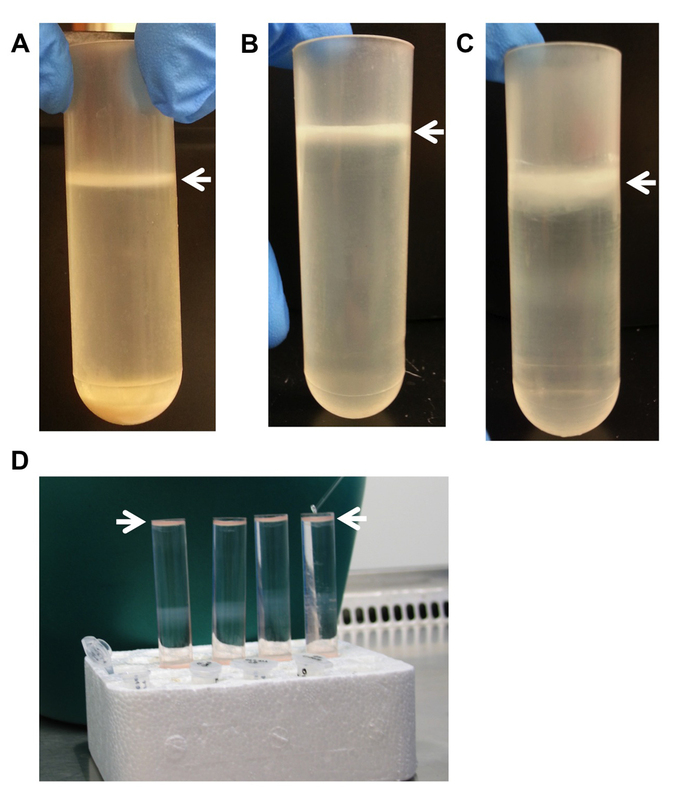 Centrifuge tubes after (A) Spin1 (step 3.8), (B) Spin2 (step 3.11), and (C) Spin3 (step 3.14) of Protocol 1. (D) Centrifuge tubes after Spin4 (step 3.6) of Protocol 2. The floating layers containing the lipid droplets are indicated by arrows. Figure 3. Analysis of the purity of the isolated lipid droplets. (A) Western Blots of key steps in Protocol 1. Equal volumes of each protein prep (Spin1 - step 3.7, Spin2 - step 3.10, and Spin3 - step 3.13) was separated by SDS-Page, transferred to nitrocellulose membranes, and immunoblotted with antibodies for Erg6p (LD, lipid droplets), Dpm1p (ER), Por1p (MT, mitochondria), Pma1p (PM, plasma membrane), and Vma1p (vacuoles). (B) Phase contrast (P.C.) and wide field fluorescence (Fluor.) images of BODIPY 493/503-stained lipid droplets that have been isolated from human placental villous cells. (C) Western blots of key steps in Protocol 2. Equal percentage pf PNS (post nuclear supernatant), supernatant below the floating layer after the last spin (Spin4 - step 3.6), subsequent wash (Spin5 - step 3.8), and floating layer (LD) were separated by SDS-Page, transferred to membranes and immunoblotted with antibodies for perilipin 2 (LD, lipid droplets), calnexin (ER), GM130 (Golgi matrix protein, Golgi), COX IV (cytochrome c oxidase; MT, mitochondria), and MEK1 (MAPK kinase; PM, plasma membrane). Please click here to view a larger version of this figure. Make sure to be consistent with media and cell densities during growth of cultured cells. Cellular lipid droplets are unique in that their associated proteins are highly dependent upon the environment in which the cells are cultured17. Therefore, the media in which the cells are grown and the density of the cells should be closely monitored before lysis. The protein composition of lipid droplets is a function of the growth phase of the yeast cells. Fewer proteins will be bound to the droplets in log growth phase versus stationary phase. Also, spheroplasting efficiency is a function of the growth phase of the yeast cells. Cells in log growth phase will have higher yields of spheroplasts than cells in stationary phase because the latter are more resistant to enzymatic treatment. Make sure to use gentle techniques to break open the cells. Techniques that break down the yeast cell wall by enzymatic digestion are preferred over techniques that rupture the cell wall through applied force. The latter method may disrupt the structural integrity of the droplets resulting in loss of bound proteins or lipids. Avoid freezing samples after the cells have been lysed. Freezing droplets is not recommended because it can affect their structural integrity resulting in the loss of bound protein or lipids. Freezing could also cause the droplets to fuse or fragment24. This may be especially relevant since droplets have been observed to fragment or undergo fission in live yeast cells25 and thus breakdown of larger droplets into smaller ones is possible. Pieces of droplets that fragment may not have the buoyancy to appear in the floating layer during density gradient centrifugation. This could artificially reduce the number of droplet factors that would be identified by this technique since the protein composition of droplet surfaces may be a function of droplet size32. Make sure to test the localization of lipid droplet associated factors to lipid droplets. One of the characteristics of lipid droplets is that they interact with other organelles33-37. Therefore, factors from these organelles are often found in the lipid droplet fraction. Therefore, it is important to use additional techniques to ensure that these factors localize to the droplets. Studies with a fluorescent fusion protein linked to the protein of interest in cells where the lipid droplets are stained with a different fluorescent marker should be used to determine the extent of colocalization15.Techniques such as protein correlation profiling can be used to further quantify the purity of the lipid droplet fraction15. In that strategy, two components are each labeled with different isotope-containing amino acids. The first component is a known lipid droplet factor, and the second component is the fraction that is being analyzed. Comparisons are then made between the fractional locations of the two components. Modifications to Protocol 1 for isolating lipid droplets from the budding yeast Saccharomyces cerevisiae are noted. Note that the sizes of lipid droplets can vary greatly. Density gradient centrifugation speeds may need to be increased for smaller droplets to accumulate in the floating layer. Access to an ultra centrifuge with a swinging bucket rotor is essential for the isolation of cellular lipid droplets. Although this piece of equipment is standard in most cell biology and biochemistry laboratories, it is expensive. Lipid droplet isolation is most useful for subsequent proteomic and lipidomic analysis of bound proteins, neutral lipids and phospholipids. Inventories of lipid droplet associated proteins and lipids have been compiled4,6-17,19,20,22,23,28. This work was supported by American Heart Association award 13SDG14500046 to P.D., a Sustainable Energy Education & Research Center Award (Univ. of Tennessee) to P.D., and by the Physicians’ Medical Education and Research Foundation (Univ. of Tennessee) award to J.M. The authors thank Caroline Leplante (Yale Univ.) for the protocol for converting fission yeast to spheroplasts; Eric T. Boder (Univ. of Tennessee) for the use of his shaking incubators, tabletop centrifuge, and Western Blot analysis equipment; and the Center for Environmental Biotechnology (Univ. Tennessee) for the use of their ultra-centrifuge; Günther Daum for yeast antibodies (Graz Univ. of Technology, Austria); the personnel of the Department of Obstetrics and Gynecology (Univ. Tennessee Medical Center) for technical assistance. Yeast extract with 5 supplements (YE5S) Sunrise Science Products 2011 YE5S media with 225 mg/ml of each supplement: adeninie, histidine, leucine, lysine, uracil. The equivalent for budding yeast would be YPD. Ploegh, H. L. A lipid-based model for the creation of an escape hatch from the endoplasmic reticulum. Nature. 448, 435-438 (2007). Herker, E. Efficient hepatitis C virus particle formation requires diacylglycerol acyltransferase-1. Nat. Med. 16, 1295-1298 (2010). Ding, Y. F., et al. Isolating lipid droplets from multiple species. Nat. Protoc. 8, 43-51 (2013). Kalscheuer, R., et al. Preparative isolation of lipid inclusions from Rhodococcus opacus and Rhodococcus rubber and identification of granule-associated proteins. Arch. Microbiol. 177, 20-28 (2001). Low, K. L., et al. Lipid droplet-associated proteins are involved in the biosynthesis and hydrolysis of triacylglycerol in mycobacterium bovis bacillus calmette-guerin. J. Biol. Chem. 285, 21662-21670 (2010). Leber, R., Zinser, E., Zellnig, G., Paltauf, F., Daum, G. Characterization of lipid particles of the yeast, Saccharomyces cerevisiae. Yeast. 10, 1421-1428 (1994). Grillitsch, K., et al. Lipid particles/droplets of the yeast Saccharomyces cerevisiae revisitied: lipidome meets proteome. Biochim. Biophys. Acta. 1165-1176 (2011). Binns, D., et al. An intimate collaboration between peroxisomes and lipid bodies. J. Cell Biol. 173, 719-731 (2006). Ivashov, V. A., et al. Lipidome and proteome of lipid droplets from the methylotropic yeast Pichia pastoris. Biochim. Biophys. Acta. 1831, 282-290 (2013). Connerth, M., Grillitsch, K., Kofeler, H., Daum, G. Analysis of lipid particles from yeast. Lipidomics: Vol. 1: Methods and Protocols. 579, 359-374 (2009). Wolinski, H., Kohlwein, S. D. Microscopic analysis of lipid droplet metabolism and dynamics in yeast. Methods Mol. Biol. 457, 151-163 (2008). Jolivet, P., et al. Protein composition of oil bodies in Arabidopsis thaliana ecotype WS. Plant Physiol. Biochem. 42, 501-509 (2004). Katavic, V., Agrawal, G. K., Hajduch, M., Harris, S. L., Thelen, J. J. Protein and lipid composition analysis of oil bodies from two Brassica napus cultivers. Proteomics. 6, 4586-4598 (2006). Zhang, P., et al. Proteomic study and marker protein identification of Caenorhabditis elegans lipid droplets. Mol. Cell. Proteomics. 11, 317-328 (2012). Krahmer, N., Hilger, M., Kory, N., Wilfling, F., Stoehr, G., Mann, M., Farese, R. V., Walther, T. C. Protein correlation profiles identify lipid droplet proteins with high confidence. Mol. Cell Proteomics. 12, 1115-1126 (2013). Cermelli, S., Gou, Y., Gross, S. P., Welte, M. A. The lipid-droplet proteome reveals that droplets are a protein-storage depot. Curr. Biol. 16, 1783-1795 (2006). Brasaemle, D. L., Dolios, G., Shapiro, L., Wang, R. Proteomic analysis of proteins associated with lipid droplets of basal and lipolytically stimulated 3T3-L1 adipocytes. J. Biol. Chem. 279, 46835-46842 (2004). Liu, P. S., Ying, Y. S., Zhao, Y. M., Mundy, D. I., Zhu, M. F., Anderson, R. G. W. Chinese hamster ovary K2 cell lipid droplets appear to be metabolic organelles involved in membrane traffic. J. Biol. Chem. 279, 3787-3792 (2004). Fujimoto, Y., et al. Identification of major proteins in the lipid droplet-enriched fraction isolated from the human hepatocyte cell line HuH7. Biochim. Biophys. Acta. 47-59 (2004). Sato, S., et al. Proteomic profiling of lipid droplet proteins in hepatoma cell lines expressing hepatitis C virus core protein. J. Biochem. 139, 921-930 (2006). Umlauf, E., Csaszar, E., Moertelmaier, M., Schuetz, G. J., Parton, R. G., Prohaska, R. Association of stomatin with lipid bodies. J. Biol. Chem. 279, 23699-23709 (2004). Zhang, H. N., et al. Proteome of skeletal muscle lipid droplet reveals association with mitochondria and apolipoprotein A-I. J. Proteome Res. 10, 4757-4768 (2011). Wu, C. C., Howell, K. E., Neville, M. C., Yates, J. R., McManaman, J. L. Proteomics reveal a link between the endoplasmic reticulum and lipid secretory mechanisms in mammary epithelial cells. Electrophoresis. 21, 3470-3482 (2000). Brasaemle, D. L., Wolins, N. E. Isolation of lipid droplets from cells by density gradient centrifugation. Curr. Protoc. Cell Biol. 3.15.1-3.15.12 (2005). Long, A. P., et al. Lipid droplet de novo formation and fission are linked to the cell cycle in fission yeast. Traffic. 13, 705-714 (2012). Petroff, M. G., Phillips, T. A., Ka, H., Pace, J. L., Hunt, J. S. Isolation and culture of term human trophoblast cells. Methods Mol. Med. 121, 203-217 (2006). Cho, S. Y., et al. Identification of mouse Prp19p as a lipid droplet-associated protein and its possible involvement in the biogenesis of lipid droplets. J. Biol. Chem. 282, 2456-2465 (2007). Ding, Y. B., Wu, Y. B., Zeng, R., Liao, K. Proteomic profiling of lipid droplet-associated proteins in primary adipocytes of normal and obese mouse. Biochim. Biophys. Acta. 44, 394-406 (2012). Jagerstrom, S., et al. Lipid droplets interact with mitochondria using SNAP23. Cell Biol. Int. 33, 934-940 (2009). Xu, N. Y., et al. The FATP1-DGAT2 complex facilitates lipid droplet expansion at the ER-lipid droplet interface. J. Cell Biol. 198, 895-911 (2012). Ozeki, S., Cheng, J. L., Tauchi-Sato, K., Hatano, N., Taniguchi, H., Fujimoto, T. Rab18 localizes to lipid droplets and induces their close apposition to the endoplasmic reticulum-derived membrane. J. Cell Sci. 118, 2601-2611 (2005). Yang, H. Y., Galea, A., Sytnyk, V., Crossley, M. Controlling the size of lipid droplets: lipid and protein factors. Curr. Opin. Cell Biol. 24, 509-516 (2012). Jacquier, N., Choudhary, V., Mari, M., Toulmay, A., Reggiori, F., Schneiter, R. Lipid droplets are functionally connected to the endoplasmic reticulum in Saccharomyces cerevisiae. J. Cell Sci. 124, 2424-2437 (2011). Pu, J., Ha, C. W., Zhang, S., Jung, J. P., Huh, W. K., Liu, P. Interactomic study on interaction between lipid droplets and mitochondria. Protein Cell. 2, 487-496 (2011). Shaw, C. S., Jones, D. A., Wagemakers, A. J. M. Network distribution of mitochondria and lipid droplets in human muscle fibres. Histochem. Cell Biol. 129, 65-72 (2008). Goodman, J. M. The gregarious lipid droplet. J. Biol. Chem. 283, 28005-28009 (2008). Brasaemle, D. L., Wolins, N. E. Packaging of fat: an evolving model of lipid droplet assembly and expansion. J. Biol. Chem. 287, 2273-2279 (2012).